Juvenal’s Duskywing and Horace’s Duskywing are our two larger duskywings. Juvenal’s is the most common, and its range extends further northward than Horace’s, well into upstate New York and southern Vermont, New Hampshire and Maine, whereas Horace’s barely reaches into New Hampshire. Juvenal’s is normally univoltine, but Horace’s has at least two broods here. Juvenal’s, Horace’s, Mottled (E. martialis), Columbine (E. lucilius), and Persius (E. persius) Duskywings are all named after Roman poets, a convention started by Fabricius when naming juvenalis and followed by Scudder or Scudder and Burgess in naming the other species (Zirlin 1993). The Wild Indigo Duskywing (E. baptisiae), separated out as a species many years later in the 1930’s, is quite helpfully named for its host plant. Scudder likewise reported Juvenal's as very abundant in “Connecticut and the southern half of Massachusetts, including Cape Cod and the Connecticut valley...” (1889: 1482). He cites specimens from Amherst (Parker) and Belchertown (Sprague) in the valley, and Andover (Scudder) and Foxboro (Emery) in the east. Boston-area specimens had also been taken in Saugus (at Cliftondale) and Melrose (at Wyoming) in 1874 (Psyche 1, 4: 16, August 1874). F. H. Sprague began collecting in the Wollaston area near Boston in 1877, and found Juvenal's there on May 21, 1878 and in 1883, 1885, 1895 and 1897 (MCZ specimens; Sprague 1879). He also found it in Malden (1883, 1895, 1896) and Milton Blue Hill (1883). Virtually every collecting area around Boston yielded specimens of Juvenal's Duskywing at the turn of the century, including Dedham (1891, 1892, A. P. Morse); Wellesley (1890, 1891, A. P. Morse); and Waltham (an over-enthusiastic 14 specimens, 1897, C. Bullard). There are specimens from Weston (1918, 1920, J. B. Paine), Tyngsboro near Andover (1919, 1921, H. C. Fall); and Walpole (1930). The earliest Cape Cod specimen in museums seems to be Barnstable, 1949, C. P. Kimball. Prior to European settlement, Juvenal’s Duskywing was no doubt common in dry, sandy scrub oak barrens and oak woods openings. It probably continued to flourish as land was cleared for agriculture (Table 1). It appears to thrive in dry, disturbed habitat using young re-growing oaks; interesting early (1876) specimens are from Centre, N.Y. (W. W. Hill), now the Karner pine barrens near Albany (MCZ). By 1934, Farquhar lists Massachusetts specimens from the towns of Milton, Framingham, Swampscott, Manchester, Lynn, Lynnfield, Stoneham, Phillipston in north-central Massachusetts, and Nantucket, in addition to the locations cited by Scudder. On the islands F. M. Jones and Charles Kimball reported it "quite common over the eastern half" of Nantucket, and "widely distributed, more abundant in the Plains Area" [now Katama Plains] on Martha's Vineyard (Jones and Kimball 1943). L. W. Cleveland's 14 May 1939 specimen, and two F. M Jones specimens (n.d.) from the Vineyard are at Yale. C. P. Kimball specimens from Nantucket are in the Maria Mitchell Museum on the island. In the 1960's, Juvenal's Duskywing was found at Canton Blue Hills Reservation (5/20/1966), in Concord and Acton by C. G. Oliver, and in Westwood by D. W. Winter. In the 1970's, there are Juvenal's Duskywing specimens from Medfield and Needham by R. E. Grey, and from Sturbridge (5/7/1977) in Worcester County by D. F. Schweitzer. In the 1980's, Juvenal's was documented from the pitch-pine scrub oak barrens at Myles Standish State Forest in Plymouth (5/22/1985, D. F. Schweitzer), from Middlesex Fells in Medford north of Boston (5/13/1988, D. F. Schweitzer), and from the Montague plains sand barrens (5/22/1982, D. F. Schweitzer) in Franklin County. All these specimens are at the Yale Peabody Museum. Scudder said “I have found it abundantly on the scrub oak, Quercus ilicifolia, and Riley has found it on white oak…and the chestnut oak...;” thus he correctly described its host plants, a variety of oaks (1889:1482). More recently in Massachusetts D. F. Schweitzer has recorded Juvenal’s Duskywing using both red and white oak (MAS 1986-90 Atlas). The Connecticut 1995-1999 Atlas volunteers observed eggs or larvae in the wild on red oak, black oak, and scrub oak (O’Donnell et al., 2007). It may also use other oak species such as chestnut oak and post oak. All of these oaks occur in Massachusetts. In the summer of 2009, photographer Sam Jaffe found numerous caterpillars of Juvenal’s Duskywing in the higher, drier areas of the Great Blue Hills south of Boston. He reports that the most common host plant was scrub oak, but that red and scarlet oak were also used. Final instars were found in late September and October (Jaffe 2009). Juvenal’s overwinters as a late-instar caterpillar, pupating and emerging in the spring. MBC sighting totals 2000-2007 rank Juvenal's Duskywing as “Uncommon to Common” in relation to truly “Abundant” species such as Cabbage White and “Common” ones like American Copper (Table 5). Still, it is seen in the highest numbers of any of the duskywings. Horace's, Sleepy and Dreamy Duskywings all rank as Uncommon, and Wild Indigo is on the low end of Uncommon-to-Common. The 1986-90 MAS Atlas said that Juvenal’s was “common to abundant." Club sightings per total trips 1992-2009 (Chart 77) show a strong pattern of cyclical fluctuation: the years 1992 through 1997, and 2002 through 2006, were poor years for Juvenal’s, whereas 1998 through 2001 and 2007 through 2009 were years with larger numbers of sightings. Despite the fluctuations, there is also an overall drift upward over these years, which can be illustrated by linear regression (R²=0.108) of the data. List-length analysis of these data also show a statistically significant 74.3% increase in the population trend of Juvenal's Duskywing between 1992 and 2010 (Breed, Stichter, Crone 2012). Horace’s Duskywing showed a smaller, non-significant increase over this period. The 1986-90 MAS Atlas found Juvenal’s throughout the state, commenting that it was “probably resident in every town.” BOM-MBC records confirm that distribution, and add new records for many areas. Between 1991 and 2013 there are records of Juvenal’s in 166 of a possible 351 towns in the state. Sightings are well-distributed across the state. For Cape Cod, Mello and Hansen (2004) say that Juvenal’s is “common Capewide”, and the Martha’s Vineyard checklist ranks Juvenal's as “common to abundant” (Pelikan 2002). BOM-MBC records support these characterisations. For Nantucket, on the other hand, although the Atlas had three records (6/7/1988, 6/11/1988, and 5/19/1990), and contemporary observers believe it is probably a "regular breeder" there (LoPresti 2011), there are in fact no BOM-MBC records. There is at least one record for the Boston Harbor Islands (Mello 2003), and one from Cuttyhunk (6/3/1988, M. Mello). Atlas records were “spotty" in northern Worcester County and the Berkshires. BOM-MBC records indicate that the species is now quite easily found in northern Worcester County: there are consistent reports from Royalston, Winchendon, Leicester, Hubbardston/Barre Falls Dam, and also from Montague, Shelburne and Whately in Franklin County. At Wachusett Meadow WS in Princeton, records indicate that Juvenal’s Duskywing is “Common” (4-20 individuals found on a trip during the flight period) (MBC Site Guide 2005). In Berkshire County the species is still uncommon, and BOM-MBC records are few, with very low numbers. The three long-running Berkshire NABA Counts do not report Juvenal's Duskywing because its main flight period has finished before the Counts begin in July. Small numbers of Juvenal’s have been reported infrequently from such northern and central Berkshire locales as Williamstown 5 on 5/17/2000, P. Weatherbee; Windsor Moran WMA 1 on 6/21/2002, M. Lynch; Adams Greylock Glen 1 on 6/6/2001, P. Weatherbee; and Mt. Greylock 1 on 6/5/2013 and 1 on 5/20/2001, T. Gagnon et al.. At MAS Pleasant Valley WS in Lenox and at MAS Canoe Meadows WS in Pittsfield, records by Rene Laubach and others indicate that Juvenal’s Duskywing is uncommon to rare (MBC 2005, Site Guide). Juvenal's Duskywing may be more common in southern Berkshire County: the Atlas had seven records from southern Berkshire towns, from Stockbridge, Sheffield, Mt. Washington and Egremont. BOM-MBC has one record, 5 on 5/18/2013, Sheffield and Great Barrington, M. Arey and A. Grkovich. Belchertown Quabbin Park max. 30 on 5/9/1999, M. Lynch and S. Carroll; Chilmark max. 30 5/9/2000, A. Keith; Douglas State Forest max 10 on 5/12/2001, M. Lynch and S. Carroll; Easthampton Mt. Tom State Res. 10 on 5/17/2010, C. Kamp; Edgartown State Forest max 40 on 5/10/1999 M. Pelikan; Foxboro Lamson Rd. 16 on 5/17/2012, M. Champagne; Gloucester max. 23 on 5/5/1998 D. Savich and C. Tibbits; Grafton Dauphinais Park 20 on 5/2/2010, D. Price; Hingham World's End 25 on 5/13/2010, B. Bowker; Medford Middlesex Fells 20 on 4/21/2012, M. Arey;; New Salem, max. 105 5/16/1998, D. Small; Newbury Martin Burns WMA max. 51 on 5/7/2000 F. Goodwin; North Andover Weir Hill 20 on 5/15/2010, H. Hoople et al. ; Petersham Tom Swamp max. 40 on 5/25/2009 T. Murray; Plymouth Myles Standish SF max. 43 on 5/17/2008 E. Nielsen; Princeton Wachusett Meadow WS 12 on 6/4/2011, C. Kamp et al. ; Sherborn power line max 39 on 5/6/2012, B. Bowker; Stow Delaney Park max. 100 on 5/15/2009 T. Murray; West Tisbury State Forest max. 50 on 5/14/1999 M. Pelikan, Ribbon Lots 40 on 5/13/2011, M. Pelikan; Westfield Barnes Airport max 11 on 5/24/2011 T. Gagnon and F. Model; Winchendon N. Ashburnham Rd. 20 on 5/20/2012, C. Kamp; Worcester Broad Meadow Brook WS max 35 on 5/7/2001 G. Howe; Yarmouth Dennis-Greenough Ponds, 11 on 4/19/2012, J. Dwelly. According to 1993-2008 MBC records, Juvenal’s Duskywing flies from the second week in April through the last week in June, with scattered sightings in July and August (Neilsen 2008). Earliest sightings: In the 23 years of BOM-MBC data 1991-2013, the five earliest "first sightings" are 4/10/2010 Carver Myles Standish SF M. Arey; 4/11/2012 Ware, B. Klassanos; 4/14/2000 Northbridge Larkin RA, R. Hildreth; 4/14/2002 East Longmeadow, K. Parker, (also Uxbridge West Hill Dam, B. Walker, Westfield, T. Gagnon, and Worcester Broad Meadow Brook, G. Howe, same date); and 4/14/2006 Boxford M. Arey and Stow Assabet River NWR, J. Forbes. The influence of the especially warm springs of 2010 and 2012 can be seen here. In ten of the 23 years (about half), the first sightings of Juvenal’s occurred in the third week of April or earlier (prior to 4/21). These ten years of early sightings were all post-1996. The Atlas had reported the earliest flight date during the 1980s as April 23, 1988; many dates today are earlier than that. Juvenal's Duskywing would be a good candidate for studying long-term correlation of average flight time with average local spring temperatures, to further specify its apparent responsiveness to ambient temperatures. A century ago Scudder wrote that in the Boston area Juvenal's Duskywing made its advent "in the first days of May, and was once observed by Miss Guild on April 28th" (1899: 1484). Today's first flight dates are considerably advanced since then. Latest flight dates: In the same 23 years of BOM-MBC data, reliable "last sightings" cannot be determined, because of the difficulty of separating Juvenal's Duskywing and Horace's Duskywing in the field. Horace's Duskywing has a second brood and flies into August and September. The many reports of "Juvenal's Duskywing" in July and August in BOM-MBC records cannot really be relied upon, but it is also hard to imagine that all of them are Horace's. They at least leave open the possibility that Juvenal's may be flying longer now than in Scudder's day, when they continued "to fly in faded condition until somewhat past the middle of June" (1899: 1484). Suspicion that Juvenal’s Duskywing might have a partial second brood in southern New England dates back to Scudder, who thought that a small second brood emerged about July 20 and continued through most of August. 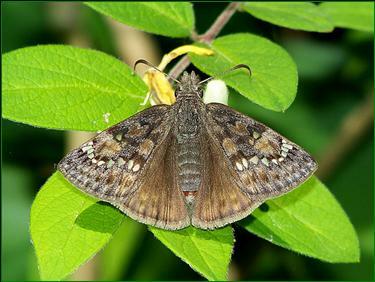 Most authorities today describe the species as univoltine throughout its range, with the late summer individuals representing either a partial second brood or mis-identified Horace’s Duskywings (Opler and Krizek 2004: 210). A partial second brood in Massachusetts cannot be ruled out. Earlier flights, possible partial second broods, and available trend data indicate that this butterfly will adapt to climate warming and probably remain common.